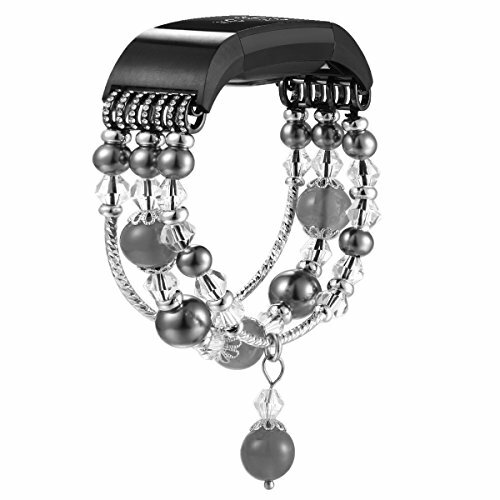 Material: Stainless steel for the connector part, Faux Pearl crystal beads, Durable elastic rope.This listing is for the replacement strap only, Fitbit watch is not included. ★【What's this Design's Original Intention?】This original design originated from designer Ms "Rachel" of "fastgo". It aims to create a feminine Fitbit charge 2 band, to help alter the bulky band to a stylish bracelet. ★【Easy to cause allergy? How about size?】Totally Nickle free, Never makes people get allergic. Handmade Crystal+ sturdy stretch cord. And it is one-size-fits-all kind which fits for 99% percent females. If you have a tiny or large wrist, welcome to contact us. The band can be customized for you according to your wrist size.